Capacities ranging from 175 gallons to 1,040 gallons actual volume. 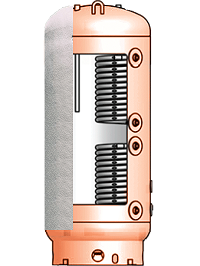 Two to sixteen standard single-wall or optional double-wall internal coil heat exchangers (quantity subject to tank capacity). Foam insulation with rigid acrylic exterior finish.